Winter is the time of year it gets colder, the sun sets earlier, we have frosty and foggy mornings, and hints of christmas start creeping up on us. I have a love hate relationship with winter; I love it because I can wrap up in hundreds of layers and stay all cosy and snug, and I hate it as I'm not the biggest fan of the cold. It's harder to get out of bed in the morning, getting into a freezing car and waiting for it to heat up seems like a lifetime goes by, and icy roads and paths scare the living crap out of me - it always seems to take me down at some point. During the wintery nights I tend to hideaway in my living room and get into a routine of cosying up on the sofa by the fire and watching TV, because it's generally too cold to do anything else. I'm sure some of you are the same, if not then I guess it's just me that hibernates in the evenings. As already mentioned in another post, this cost is my new love. This ASOS gem is everything I've ever needed but never realised it. It is the warmest, well-fitted, cosiest, and don't forget affordable, coat I've ever owned and I'm so happy I had the balls to purchase it. It's always a risk buying on ASOS as it's all online-based, the main reason I don't buy from it often, but I think I've found a new love towards ASOS, especially if everything is this beautiful and so true to size. I have recently been gathering some winter clothes, among the pile that I brought back from university, and already been wearing every single jumper I own, that's what they're for anyway. My nan had a clear out the other day and gave me this beautifully soft and warm jumper. It looks quite christmassy too which I loved, but could also get away with wearing it in spring on the colder days. Listed on my favourite things of Autumn is my gorgeous scarf from Zara - which I occasionally use it as a blanket because it's that big - and you'll see me wearing it almost everyday during the colder days because it's too snuggly not to. I did get another Zara scarf for Christmas last year which I haven't yet worn out because it's been in hiding all this time, and it's not been cold enough for me to get a scarf out just yet - either that or I just don't go outside very often at the moment - but I'm sure you'll see me wearing it in the next few weeks. 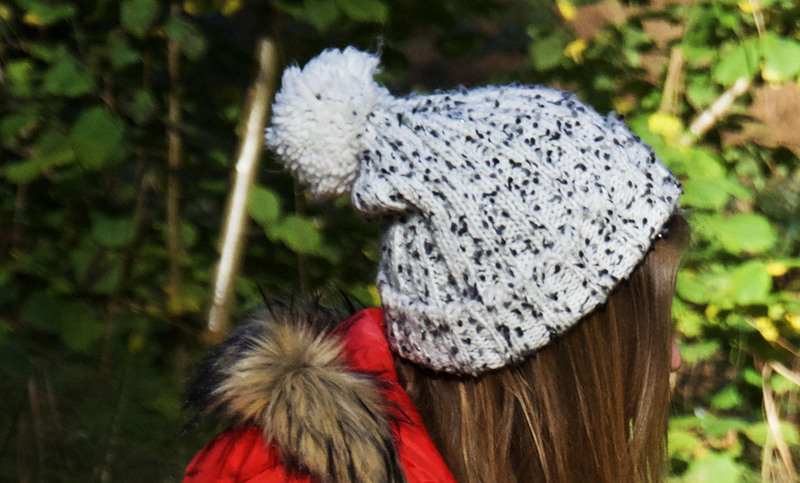 It's an oldie but a goldie, my one and only knitted bobble hat. I've had this for years and years, and I don't see myself throwing it away ever (unless my head suddenly blows up and doesn't fit into anymore). It's really comfortable and goes with any outfit because of it's neutral colours, and who really cares if it matches your outfit or not? It's pretty and I like it. I've been on about wanting new boots for a while now, and sending my mum endless photos of boots I've wanted to buy myself, but there's always been a hesitation with every single pair I've seen just because there's something missing. However, the other day my mum found these boots in a sale and asked if I liked them and I was nearly speechless because they're so beautiful and just what I was after. How does she find these things? It's like she has a magic eye and spots stuff that I never seem to see. I'm so grateful for all the great things she finds. I love new winter clothes, there's something about them which I get more excited about than summer clothes. Maybe it's just because they are cosier, warmer and usually go with anything else, especially an oversized jumper. I actually can't stop wearing this jumper because it's too comfortable, and it's easy to just throw on for the day without having to make much effort, it's a win win. I am definitely starting to feel the cold so I am endlessly wrapping myself in a big fluffy blanket to keep me warm. Slight unrelated, but I found this blanket in dunelm which is called the teddy bear throw. Teddy bear throw is a good name because it is like you're hugging a bear - not that I know what that feels like. I got a size large and it is massive, just what I wanted - go get one before they all go! What are your favourite winter clothes?